Vernon Soare, ICAEW’s Executive Director exchanges official documents with Mohammed Salih Al-Obailan, the Chairman of GCCAAO, after the two Faculties signed an agreement to develop an Audit Quality Monitoring Programme for the GCC countries. 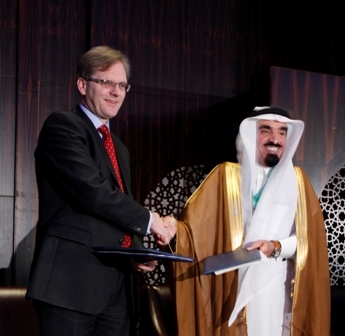 THE GULF Co-operation Council Accounting and Auditing Organisation (GCCAAO) and the Institute of Chartered Accountants in England and Wales (ICAEW) signed a landmark agreement to develop an Audit Quality Monitoring Programme for the GCC countries. The agreement – the first pan-national project of its kind – was signed at a ceremony commencing the seventh GCCAAO Annual Forum by Mohammed Salih Al-Obailan, Chairman of GCCAAO and Vernon Soare, Executive Director, ICAEW, held at the Raffles Hotel, Dubai. Also present was the UAE Minister of Economy, His Excellency Sultan bin Saeed Al Mansouri. Under the agreement, ICAEW will assist the GCCAAO in developing a world-class Audit Quality Monitoring Programme, and offer advice and support on the creation of a Gulf Monitoring Unit (GMU), to monitor the application of international standards on auditing (ISAs) in each GCC country. GCCAAO has asked ICAEW to draw on its internationally-recognised expertise and experience to advise on best practice concerning recruitment, regulation and creation of a monitoring framework. “ICAEW is recognised internationally for its rigorous commitment to professionalism and ethics, and we are delighted they will be supporting our work to make audit in the GCC member countries a beacon of quality,” he added. Work between GCCAAO and ICAEW will occur in three phases, designing an effective framework and GMU, development and implementation, and on-going support.